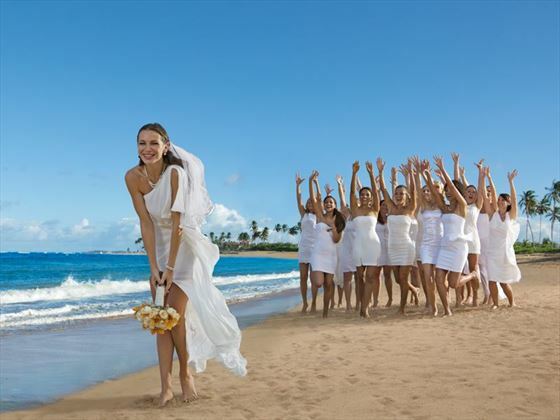 Couples looking for a lively adults-only wedding with a colourful flair will fall head over heels in love with Breathless Punta Cana. With indulgent amenities and incredible views, this is the perfect option for a luxury wedding abroad. 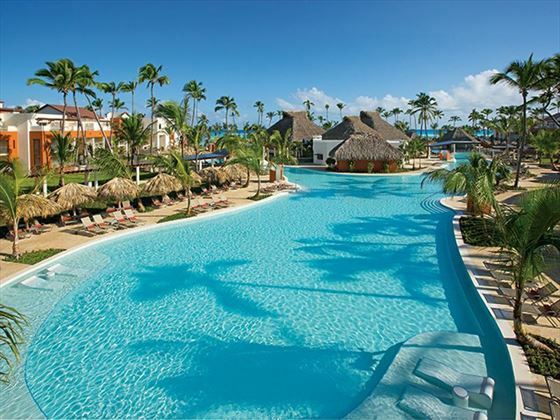 Breathless Punta Cana is one of an excellent range of luxury AM Resorts in Mexico, the Dominican Republic and Jamaica for you to choose for your ultimate wedding. 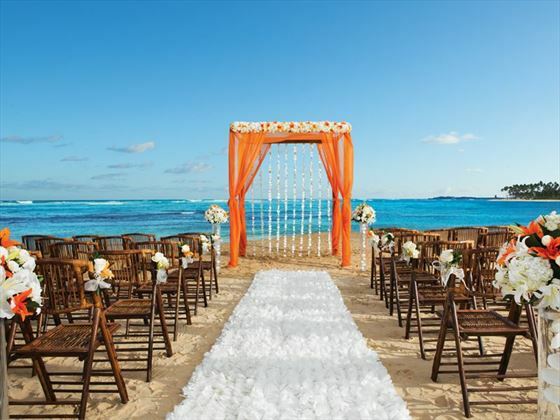 Couples looking for a lively adults-only wedding with a colourful flare will fall head over heels in love with Breathless Punta Cana. The beach wedding can accommodate up to 250 guests. All the packages include the basic setup with covered chairs for guests and table for the judge or minister. Or choose one of the 2 beautiful Sky Wedding Gazebos overlooking the ocean that we can have up to 42 guests. All the packages include the basic setup with covered chairs for guests and table for the judge or minister. You may have done some research and found that having a legal Civil wedding in the Dominican Republic can be fraught with additional costs for the Judge, or that you have to or just don’t have the time to complete the array of translations and certifications required for a legal wedding. Regardless if you booked a free wedding or not, the compulsory marriage validation, translation costs & Judge fees to perform the wedding are paid for locally and can amount up to $1000. Many wedding couples are now choosing to be legally married in the UK followed by a symbolic wedding ceremony in resort with family and friends. Symbolic weddings are less costly, and a great choice for busy couples that prefer to bypass the gathering and completion of documentation required for a legally-binding ceremony in a foreign country. The wedding package inclusions below are based on a symbolic wedding as all legal fees are paid in resort. If deciding on a full legal Civil wedding, do remember that when getting married in the Dominican Republic, you are required to have a number of document translations and apostilles on your wedding paperwork (at extra cost) as well as a Judge fee for him to conduct the legal wedding. Regardless if you booked a free wedding or not, the extra costs for marriage validation fees, wedding certificate translation fee and Judge fees to perform the wedding are paid for locally and can amount up to $1000. Please bear this in mind before committing to a legal wedding. We feel that it is best to advise you of these additional costs and as each wedding is individual we will work with you and the hotel Wedding Planners on a case by case basis to help guide you through the legal wedding process. So you’ve decided to get married overseas, and you’d love to surround yourselves with family and friends on your special day. Destination weddings have become increasingly popular and staying at the same hotel as your guests makes it a real occasion. Tropical Sky can help make all the bookings with excellent group offers. 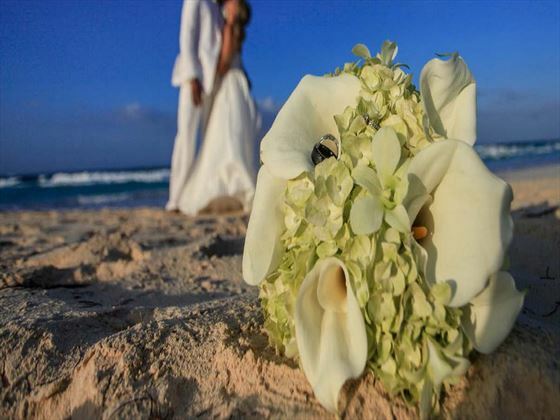 Breathless Punta Cana provide wedding parties, both small and large, with the best amenities to make the wedding celebration with friends and family as memorable as possible! Free stay for the Bride & Groom – Book 15 rooms and the 16th room becomes complimentary. This applies to all room categories. One complimentary VIP room upgrade for every 10 rooms paid. *restrictions may apply at certain resorts. You may require additional items such as extra wine, a larger wedding cake, and extra flowers. 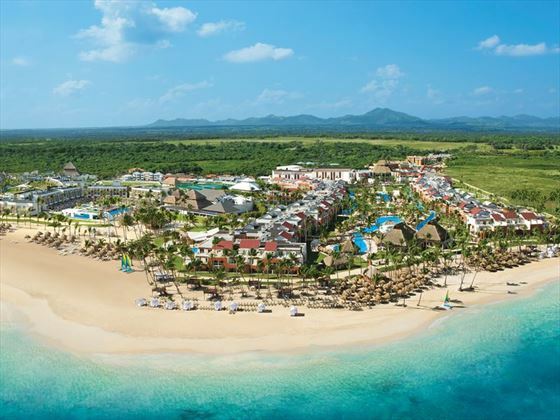 Extra costs will be obtained for you and will be payable in resort by you. If you are staying at an all-inclusive resort, guests not staying at the same resort will need to purchase a day pass (where available) to attend the ceremony. Certain numbers, gender and age restrictions may apply. Several hotels provide their own group offers. These offers can only be organised at the time of booking your wedding and cannot be added on at a later date. If any passengers cancel at a later date and the number of adults drops below the required number, this offer will no longer be applicable. Complimentary room is subject to availability and may be withdrawn without notice. The complimentary room will be offered against the majority of the duration of the rooms booked. For example, if 10 rooms out of 15 book for 7 nights the complimentary room would be offered for 7 nights. The complimentary room upgrade will be offered against the majority of the same room category booked for the duration of the holiday. For example, if 10 rooms out of 15 book a lead in room category the complimentary upgrade will be offered to the next available room. Please note that a US$100.00 per person deposit is payable at time of booking/within 1 month of booking. A second deposit of 50% of the total rooms booked is due 120 days prior to travel and final balance and any further confirmed functions is due 90 days prior to arrival with confirmed guest list. Any changes within 90 days before travel could incur cancellation fees and the loss of any group offer. Any discount or upgrade will be allocated once final balance has been paid.